Being a fan of The Walking Dead television show specifically, and apocalyptic fiction in general, I snagged a copy of The Walking Dead: Rise of the Governor, by Robert Kirkman and Jay Bonansinga. 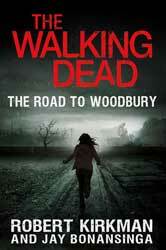 The novel was published in October, 2011 and is a spin-off of The Walking Dead comic book series. 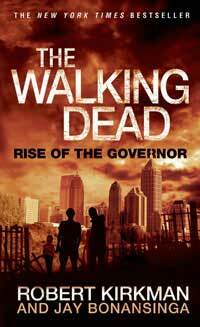 The book explores the background and origin of one of the series' most infamous villains, The Governor. The novel begins not long after the start of the zombie apocalypse. TV stations, radio stations, and other services are going off the air one by one. The living are becoming scarcer, more desperate, and more dangerous. People are fleeing and hiding as the zombies begin to take over the countryside. We're introduced into this world through Philip Blake, his daughter Penny, his older brother Brian, and Phillip's friends Bobby and Nick, sharing their struggles to survive. And that's mainly what this is -- a survival story. The course of the book follows the adventures (and misadventures) Phillip and his small group as they seek refuge and safety, and as they begin to fully understand just how messed up everything has gotten. Whenever they find a haven, it's not long before the rotten jaws of reality clamp down. It's an interesting examination on the nature of the survival instinct, and how different characters deal with hopelessness and fear. We see some rise to the occasion, while others collapse under its weight. As far as characters, Phillip Blake never rises much above his characterization as a not-very-good person whose only admirable trait is his love for his daughter Penny. Brian, his brother, is presented as a polar opposite, a physically and mentally weak man seemingly good for little more than babysitting Penny. Phillips two friends are similarly two-dimensional. It isn't until the very end that we see some development beyond these stereotypes. Although titled "The Rise of the Governor", the Governor himself doesn't make an appearance until the end of the book, in a quite unexpected yet logical way. It's more about the birth or creation of the Governor as opposed to his rise to power. The novel is a written in present tense and is a fast read. No doubt those who've watched the show will have their visuals influenced by the program. The authors seem to get a little carried away when describing the zombies and the gore. Tip to all aspiring authors: description is often a lot more fun to write than it is to read. Phrases like "blackened, rotting teeth" (and others) will become numbingly familiar to you by the end of the book. You don't have to be a fan of the show or graphic novels to enjoy this, it works well-enough on its own and is sure to appeal to any zombie or end-of-the-word fiction fan. Having some knowledge about the Governor and the world of The Walking Dead, either from the show or the graphic novels, will help though and make it more fun.